Until I saw this photo I had never really thought about or wanted to own a camper. I would love to take this one on a road trip up to the mountains this weekend. 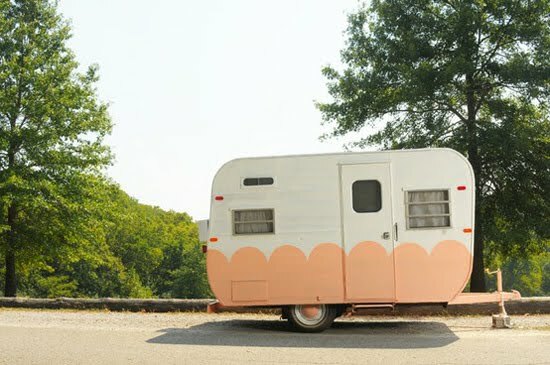 Since I do not own a camper I think that I will just relax at home and maybe swing by the usual thrift stores. Do you have any exciting plans for the weekend? Whatever you end up doing I hope you have a great weekend! Kaelah at Honey Bee in the City did such an amazing job remodeling this old camper. Click HERE to see the before and after, including photos of the charming interior. Just a note to say I enjoy your blog. Not only for its content but also because you are one of only a few who post with a running show of what you've done. By this I mean you can keep scanning down to see more and more. My pet peeve are bloggers who only show one post with comments etc. and then you have to click "next" or "previous"....take too long to scan through a weeks worth if that's all the time one has. Please keep this method. Relaxing weekends are sometimes the best. Enjoy yours and I hope you are feeling good! I adore little trailers!!!! I want one so bad!!!!! They really did a super job on their refurbishing!! !......sigh........love it!! Our plans are easy....high school football game tonight, church Sunday with a whole lotta see-what-happens in between!! :) Oh, and some crochet for sure! !